Keyboards, trackpads and mouses are so last century. How about controlling your computer with a doughnut. Well now you can! Touching the object will then send a signal back to the computer. This can be customised to produce a mouse click or anything else. According to Makey Makey's Kickstarter campaign, such objects can be some jelly (to play Flappy Bird), a banana (which you can play the piano on) or a water slide selfie taker. You can even programme it to help a dog make a Skype call! The Makey Makey Go is based on the inventor's original Makey Makey, now called Makey Makey Classic. 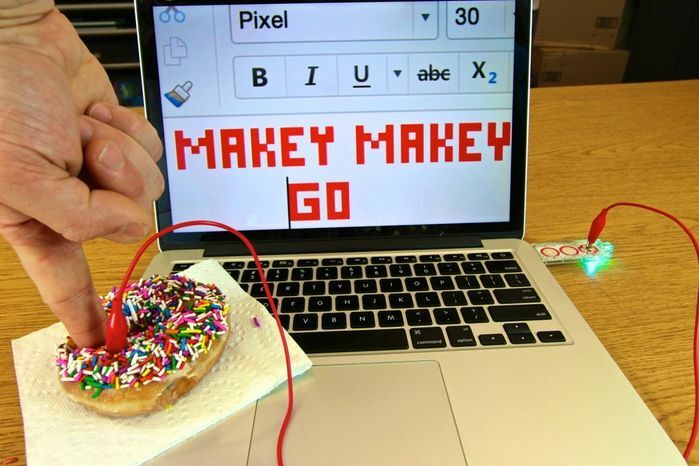 “We redesigned Makey Makey Classic to focus it down to its absolute bare essentials: a single capacitive sensor input with a single alligator clip that can pretend to be any key or a mouse click,” the inventors said on their Kickstarter page. The device costs $19 and should work with Windows 7 or higher, Mac, some Android devices, most fruit and processed food.